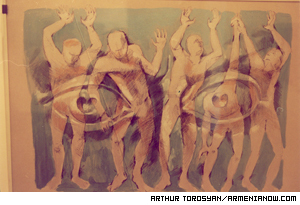 Torosyan's Khachaturyan-inspired paintings include this one of the slaves in the ballet "Spartak". 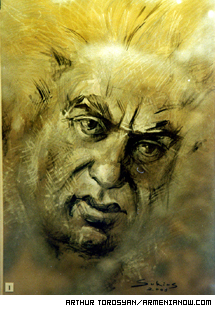 The 100th anniversary of the birth of Armenian composer Aram Khachatryan is being celebrated in many nations of the world by many musicians. But honor for the musical genius is not exclusive to notes on a score. An Armenian painter has transformed musical notes into brush strokes. With gentle color contrasts of watercolor and pastels, using light and rich tints, artist Sukias Torosyan combines the music of the composer with the images of a painter. Torosyan has created a 32-piece series that draw reference from three major Khachatryan compositions: "Gayane", "Masquerade" and "Spartacus". The painter's own musical roots go deep. "I was three when I got up on stage (to perform in opera and ballets) for the first time. 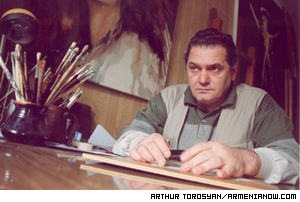 That was when I also heard and painted Khachatryan," Torosyan says. Meeting the composer left an eternal imprint in the painter's mind. "He had a proud figure, slender, lively, but when he saw children he would become childish and on a par with them in their carefree pranks." The painter's portrait of the composer. Mentally, the painter replayed each Khachatryan note. The composer is, for him, a phenomenon born from the ashes of Armenia's brutal history of the early last century. "During the time when our nation seemed to have fallen on its knees, with his art he proved to the world that we have an unlimited power to keep on living," says Torosyan. "Dance of the Swords" (from "Gayane"), Khachataryan's most famous piece, gets a special treatment by the painter. Instead of the famous ballet scene of boys with swords, Torosyan portrayed the process of making wine in the arms of heavenly nature. "What can be more dynamic, full of life, masculine and at the same time crystal clear, than the making of wine," he explains. The jealousy scene of the ballet is also peculiar, where that feeling is portrayed as an enormous red-hot lump and under its destructive impact veiled with mysterious sorrow people become evil, cold and unsubstantial, then freeze and vanish. "Through the painter's art works of the great composer become more accessible and perceivable, because while listening to the music all the images take shape in one's mind. In this case the characters were embodied in canvas, they became visible and tangible," says a 5th year student of the Conservatory Hrayr Martirosyan. The painting of 44-year old Torosyan has shared other artistic expression, such as directing, stage decoration and caricature. The painter has been a fan of the composer since age 3. When he was young Torosyan, as a superior student, was sent to study at Leningrad Academy of Arts. But it was not a suitable fit for the artist. "My unusual and non-standard mentality was unacceptable for the Soviet regime," he says. "So one day I was told I'm a surrealist and what they needed was academic painters." Upon returning to Yerevan the young painter continued his studies at Yerevan Art Academy, at the same time doing stage decorations at State Opera and Ballet Theatre named after Spendiaryan. "Opera is a mixture of arts, where all types of art are combined, where singing crosses with dancing and music crosses with theatre," says the painter. In 1997 Torosyan expressed his new word in theatre art, by presenting an unprecedented improvised performance of synthetic art. His first was a composition done with extracts of the opera "Carmen" and Spanish folk music, to the accompaniment of People's Artist of Armenia Hovik Divanyan was doing dance improvisations. On big canvasses placed on the stage Torosyan created color and image compositions consistent with music and the mood of the moment. 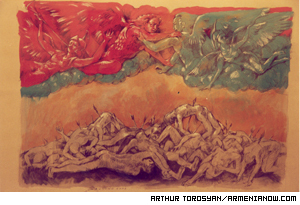 Inspired by the ballet "Spartak", Torosyan's painting also depicts Armenia's fight for independence, and enough lost lives, the painter says to make a mountain like Ararat. "Everything is created under the influence of a moment, we know what we want, we have the concept, but all of that gets more meaning through improvisation," says the painter. The performance had also great success in Beirut and Syria. In 1998 the painter produced a new performance based on Mozart's "Requiem" and dedicated it to the 10 anniversary of the 1988 Spitak earthquake and through the art of dance and painting he "tried to defeat death". According to the concept of performance the idea of defeating death was expressed through colors. There were two canvasses on stage, a black and a white one. At the end of performance the black one gets covered with bright and lively colors and merges with the eternal purity of the white. "We did not sell tickets for this performance, instead we asked people to bring children's books which we afterwards gave to the children of Gyumri and Spitak," says Torosyan. "The imagination of Torosyan creates surprising ideas and while watching his paintings I can hear the music flowing out of them," says Divanyan. According to him each image of the painter is an ideologically inexhaustible source of dance performance. The master of painting and performance showed his worth also in the sphere of caricature. During the past eight years his works were published in Azg and Aravot news dailies, under the nickname Toto. According to the painter caricature has to show the words and problems between the lines or hidden in most deep pleats of the human brain. The cartoons of Toto, a member of Eurohumor are shown in Belgium, Japan, Netherlands, Germany and other countries..
"Different branches of art have merged in Sukias in a surprising way. His humor makes you laugh continuously, but after understanding the essence and depth of his works, one becomes sad. It is given from above only to talented people," says art critic Grigor Saribekyan.